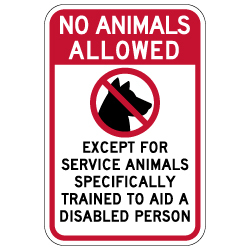 No Animals Allowed Except for Service Animals Specifically Trained to Aid a Disabled Person Sign - 12x18 - Non-Reflective Rust-Free Aluminum No Pets Allowed Signs for Outdoor or Indoor Use with Anti-weather and Anti-graffiti protection Available. DOUBLE the working life of your Service Animals Only Signs by adding 3M Protective Overlay Film (POF)! 3M’s high-tech POF protects sign faces against fading caused by the sun and harsh weather—and makes graffiti and sticker defacement damage easy to clear away without harsh abrasives.